Explore the majestic land of Russia along its rivers and waterways aboard the AmaKatarina as she sails gently along the Volga. 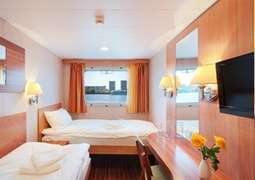 Look forward to an intimate cruising experience with enough to keep you occupied on board while having the chance to explore Europe’s best kept secret. 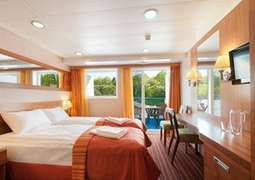 Aboard this ship you will find ten different categories of cabins and suites which all come with comfortable and stylish furnishings and modern amenities such as bathroom with shower, hairdryer, fridge, safe and beds giving you the most enjoyable travel experience yet. 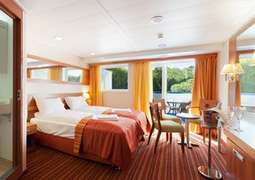 Here you will feel as if you are in a luxury hotel while sailing along Russian waters and exploring the mysterious land of the Tsars. Dining aboard the AmaKatarina consists of Russian dishes and International cuisine which are guaranteed to excite your tastebuds and allow you to give you a richer cultural experience. For breakfast you have the chance to choose from delicious buffet and for the other meals there is a restaurant with an incredible view outside. Enjoy your time on board with a lovely drink at the Panorama Lounge, and get a chance to meet other passengers, make new friends or simply relax with a friend or partner. On board the ship there is a conference hall where you can hold functions or other events. Before you leave purchase something nice for a loved one back home or yourself to commemorate your trip at the gift shop. Keep fit on board in the fitness room, making sure that you keep up with your fitness regime. You spoil yourself at the salon and have a nice massage or get your hair done.